The Savvy experts have some definite opinions on what gardeners might want to find under their tree on Christmas morning. To help you tackle your holiday wish list, we’re taking turns showing you some of our personal favorites. Jessica’s up first with three unusual gifts for gardeners that will be sure-fire hits for green thumbs everywhere. 1. If you know someone who’s interested in growing something new this year, consider giving them the gift of mushrooms. There many different types of mushroom spawn, including those you can grow on logs and stumps, as well as those you can grow in your garden and even on your countertop. For ambitious growers, purchase dowel plugs of shiitake, oyster, lion’s mane, or maitake mushrooms so they can inoculate their own cut hardwood logs or stumps. Other gardeners may prefer getting liquid spores of King Stropharia mushrooms that are easily grown by inoculating garden beds mulched with hardwood chips or sawdust – you can even grow this mushroom on straw bales! Or, if you’re looking for something even simpler, just buy them a mushroom growing kit that comes as a pre-inoculated block of compressed sawdust. They’ll simply unwrap it, set it in a tray of water, and wait for the mushrooms to arrive. 2. As far as gifts for gardeners go, every green thumb should have a old-fashioned boot scraper stationed near their backdoor. It easy cleans sticky, clumpy soil off work boots with just a few whisks through its bristles. I’m a big fan of this cast iron scraper because it’s so darned cute. 3. Container gardeners will appreciate a hand truck for hauling large pots in and out of the garage and around the deck or patio. There are lots of different brands on the market, but all boast a pair of wheels, a sturdy metal frame and handles, and a ground-level platform. Those designed specifically for transporting flower pots even have a unique adjustable mechanism that grips onto the top of the pot, preventing it from toppling over. These tools are also useful for hauling bags of potting soil and fertilizer from the car trunk to the shed. Choose a lightweight model for easier handling and one with pneumatic tires if possible. Folding models are useful for those with limited storage space. This is the one I have. 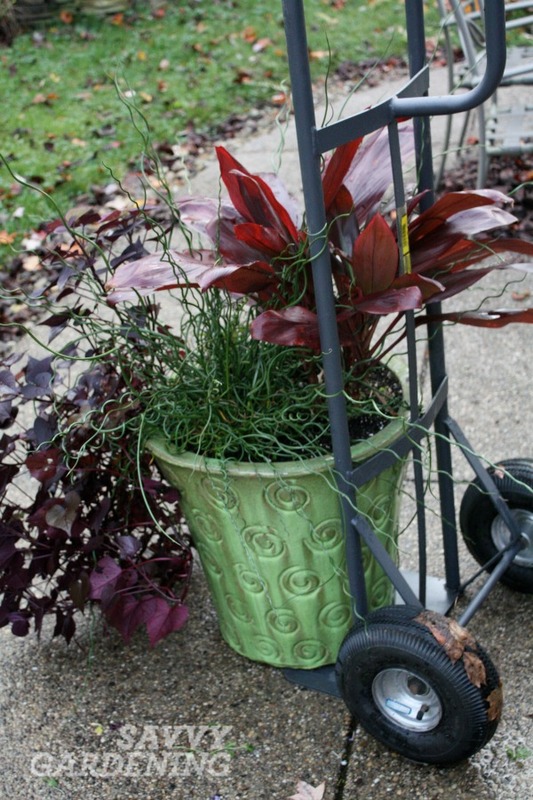 Hand trucks are great for hauling containers and other heavy items around the garden. What are your favorite gifts for gardeners?